Multinational firms have become a dominant feature of the world economy, but many dimensions of their activity are still little understood. For example, do multinational firms transplant their mode of organisation to other countries? If corporate culture matters, we would expect firms to operate with the same organisational form in the countries in which they invest. But it is also possible that the conditions prevailing in local markets may force firms to adjust their organisational form. In recent research, we examine how the economic environment affects the decision of a multinational firm to transplant its business organisation to other countries (Marin et al. 2016). We conducted a full population survey of the internal organisation of 660 Austrian and German multinational firms with 2,200 of their affiliates in Eastern Europe between 1990 and 2001. We collected information on the hierarchical level of 13 corporate decisions in affiliate and parent firms, which we show in Figure 1. We ask whether the corporate decision rights are allocated to top management (score 1 = a centralised decision), or to middle managers in parent firms and subsidiary managers in affiliate firms (score 5 = a decentralised decision). 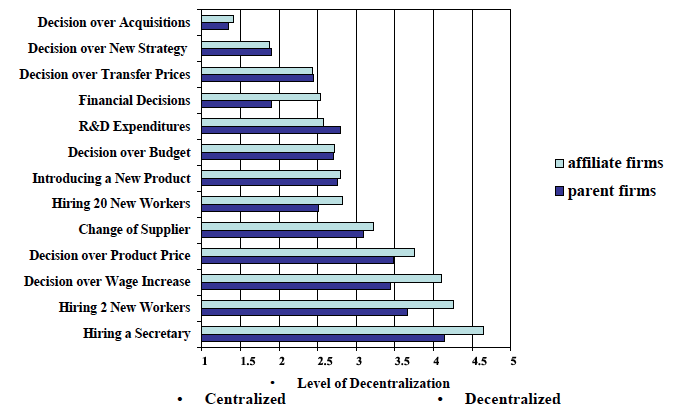 As can be seen from the figure, corporate decisions are more decentralised in affiliate firms compared to parent firms. This meant we could construct our measure of organisational transfer (Table 1), which shows the number of corporate decisions taken at the same hierarchical level in the affiliate firm as in the parent firm. Most research on multinational firms assumes that they bring technology and organisational skills to the host countries (Bloom et al. 2012), but we find that, in 68.4% of foreign investments, multinational firms do not transplant their parent firm's mode of organisation to the host country. Table 1 Do multinationals transplant their business model? Notes: The table reports the absolute number of cases and row percentages. 1 The degree of transplantation (full, close-to-full, partial and no transplantation) depends on the number of corporate decisions which are taken at the same hierarchical level in the parent and subsidiary firm. For a first impression of whether the market environment influences the decision to transplant, we looked at market size as a proxy for competition. Table 1 also shows that the size of the home market of the multinational firm matters. German multinationals, located in the larger economy, transplant their organisational form more often than Austrian multinationals. The market size of the host country in Eastern Europe also appears to be correlated with the frequency with which the parent multinational firm, whether from Austria or Germany, brings its organisational form with them when they invest in these countries (Figure 2). Notes: The figure shows the percentage of affiliate firms in a given host country with parent firm organisational form fully or close to fully transplanted. Let's assume that multinational firms decide how to organise production in the parent firm in the home market and the affiliate firm in a host country, and that the organisation of a multinational firm is a knowledge-based hierarchy in which middle managers in the parent firm and subsidiary managers in the affiliate firm deal with routine problems, and top managers solve the exceptional problems. The firm's problem is then to decide the level of decentralisation to middle managers. A more decentralised organisation, for example, allows the firm to save on top managerial wages and communication costs, but it has larger training costs for middle managers (Garicano and Rossi-Hansberg 2006). We also assume that there is monopolistic competition. Multinational firms compete with local firms in the home and host market. They either use the same level of decentralisation in the subsidiary as in the parent firm, or choose different levels of decentralisation for the parent and subsidiary firm. In the first case, they transplant the organisation of the host to the subsidiary, and in the second they do not. Solving this model, our researched showed that, in equilibrium, the decision to transplant the organisational form would become a function of market competition multinational firms face in both home and host markets. Tougher competition in the home market leads multinational firms to transplant their organisational mode less frequently. Multinational firms weigh the cost savings from replicating the optimal organisational form in the home market against the benefit of having the optimal organisation that fits the foreign market. At the margin, the firm will lean towards the organisational form where the adjustment generates larger profits. In a home market with tougher competition, the profits of the home market weigh relatively less than those from the foreign market, and the multinational firm does not transplant the organisational form to the subsidiary firm in the host market. In a host market with tougher competition, it hurts the profits of the multinational firm less when its subsidiary firm operates with an organisational form which is not optimally adjusted to the host market. When the subsidiary firm operates with the same level of decentralisation as the parent firm (when the organisation is transplanted) each unit of output is sold with a lower profit margin, reducing total profits less when competition intensifies in the host market. In the empirical analysis we indeed find that when affiliate firms face tougher competition (we measure this as an increase in the share of multinational competitors) of 10 percentage points, the probability of transplanting increases by 9 percentage points. An increase in the share of multinational competitors in the home market by 10 percentage points lowers this probability by 11 percentage points. Also, we found that when multinational firms decide to transplant the organisational mode to the subsidiary firm, they transmit the competitive conditions of one market to those of the other market. By affecting the cost of production, the organisational choice of a multinational firm acts as a transmission mechanism through which the competitive conditions in the home and host markets are linked, even when competition is segmented in the two markets (we did not allow international trade to take place). Intuitively, more competition in the home market leads to less transplanting and subsidiary firms are closer to their optimal organisational form fitting the host market. This reduces costs, leading to an increase in the toughness of competition in the host market. Similarly, more competition in the host market leads to more transplanting and parent firms avoid the efficiency loss of two organisational routines. This, in turn, reduces their costs leading to an increase in the toughness of competition in the home market. Also, we found that in theory a continuous increase in competition in the home market, which we might call globalisation, affects the reorganisation of a multinational firm because it leads to an extensive and intensive margin of reorganisation in the multinational corporation. At first, when competition is still weak, the multinational firm transplants its organisational form from the parent to the subsidiary firm. The multinational firm adjusts, however, the level of decentralisation of the whole multinational corporation towards an organisational pattern that fits optimally the subsidiary firm's market conditions. The multinational corporation becomes more decentralised (the intensive margin of reorganisation). This process can be seen as a kind of 'reverse transplanting', in which the parent firm's organisation is changed towards the optimal organisation of the subsidiary firm. When competition in the home market increases further, the multinational shifts to the 'no-transplant' strategy (the extensive margin of reorganisation) in which the organisation of the parent firm and of the subsidiary firm become disconnected. To find out whether this 'reverse transplanting' actually happens we tested in the empirical analysis the joint decision of transplanting and decentralising using a Heckman maximum likelihood model. When multinational firms decide to transplant their business organisation to the affiliate firm in the host country, an increase in the share of multinational competitors in the home market of 10 percentage points increases the level of decentralisation in the multinational corporation by between 7.5% and 17.5%. The whole multinational corporation is modified and becomes closer to the optimal level of decentralisation of the subsidiary firm. Gravity factors, such as distance, communication costs, and the cost of training managers, also matter. We find that when the distance between the parent and subsidiary firm (our proxy for communication costs) doubles, the probability of transplanting declines by 7.4 percentage points. We also find that when the share of people with tertiary and secondary education in the host market increases by 10 percentage points, which lowers the costs of training for managers, the decision to export the business model decreases by 6 percentage points. Multinational firms with human resource policies in place (our measure of corporate culture) are 18 percentage points more likely to transplant the organisational mode. A stronger corporate culture makes operating with two organisational routines more costly, increasing the probability of transplanting. Moreover, multinational firms which transfer an innovative technology to the affiliate firms are 27 percentage points more likely to transfer the organisational mode to the host country. A more complex technology increases the training costs of managers in the affiliate firms, making savings on these costs in a more centralised organisation in the affiliate firms more desirable. So organisational transfer and technology transfer appear to be complements. Why are business organisations so little transplanted? Nevertheless, a surprisingly high proportion of multinational firms that do not transplant their mode of organisation. We found that three factors contribute to the low frequency of organisational transfer. Corporate culture as a major driver of organisational transfer occurs infrequently among Austrian and German multinational firms in our data. Only 14% of firms have a strong corporate culture by having human resource policies to incentivise workers. This makes transplanting less important. The transfer of an innovative technology as a major driver of organisational transfer is rare. Among the multinational firms in our sample only 8% describe the technology they transfer to the host country as innovative, while 60% perceive the technology as established, contributing to the low frequency of organisational transplanting. Finally, in the 1990s Austrian and German multinational firms faced tougher competition from foreign firms in their home market, as trade openness doubled during this period. So globalisation made them less willing to transplant their business model to Eastern Europe. Bloom, N., J. Van Reenen and R. Sadun (2012), "Americans Do IT Better: US Multinationals and the Productivity Miracle", American Economic Review, 102(1), 167-201. Garicano, L. and E. Rossi-Hansberg (2006), "Organisation and Inequality in a Knowledge Economy", Quarterly Journal of Economics, 121(4), 1383-1435. Marin, D., L. Rousova and T. Verdier (2016), "Do Multinationals Transplant their Business Model? ", CEPR Discussion Paper 9500 (revised version).